Agent Pod-Goo Repoman reported an unusual event that occurred in the Niarja system. Following his protocols, Agent Pod-Goo destroyed an autopiloting rookie ship so he could pod its pilot. But Sophie Onren claimed that she was engaged in a different activity altogether. This sparked an intriguing debate about the Code. What does the Code have to say about ganking corpse collectors? I mean, corpse collecting isn't PvE, exactly, is it? Though the word "corpse" is not contained anywhere in the text, the Code actually has a lot to say about corpse collectors--if you give it a good, deep reading. First off, consider what happened here. Sophie was slow-boating her rookie ship toward a gate in Niarja. As a result, while Sophie was crawling around for corpses, Agent Pod-Goo mistook her for a typical autopiloting rookie ship, the kind our hero ganks every day. If you're engaged in an activity that makes you look like a Code violator, that immediately implicates the "appearance of botting" provision of the Code. I wrote an entire post on that topic a few months ago, so we don't need to go into it again here. Long story short, if you look like you're violating the Code, that's a violation of the Code in and of itself. There's something else I'd like to address about Sophie's case. Consider what she was doing. Sophie was piloting a cheap but highly vulnerable ship in a location where such ships are routinely ganked. Why did she do that? Why didn't she fly a tankier ship, or at least a faster one? Because she assumed she was safe. Because she was in highsec. That, friends, is bot-aspirancy, regardless of the particular activity she was engaged in. Imagine, for example, that you had an untanked, blingy ship perched near a gate. Suppose your purpose for being there was to enjoy the scenery, not to engage in travel or PvE. The Code doesn't mention sightseeing, but clearly you're in violation of the Code, because you're taking your safety for granted in highsec. As we all know, the Code does not permit such things. This, too, we know: That the CODE always wins. Always! Stop acting like a bot if you don't want to be treated like a bot. For easy corpse collection,first: get a permit, then: Bookmark, warp out, warp in to bookmark, collect corpse, warp out, don't act like a lazy shitter. "When offered Carebears must buy back their corpses from Agents at full asking price". 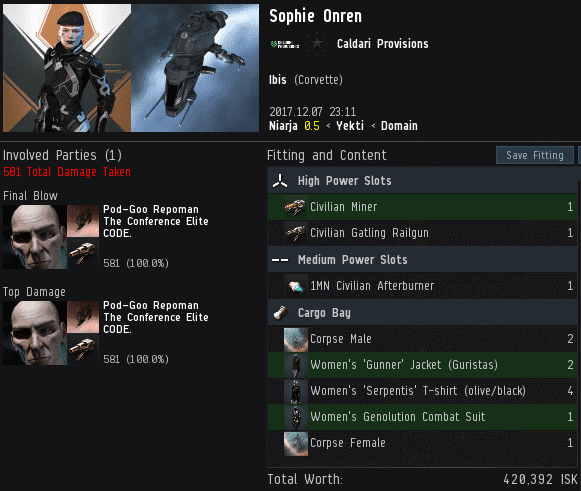 This will help the wider Eve community by facilitating ISK liquidity and reminding carebears of their lowly position. I would argue that she was using a throw away ship like that because she was aware there was a moderate chance of being ganked. Why waste money on a tankier more expensive ship just to corpse collect in a hostile area? The corpse collector had admittedly read The Code and was exploiting what she thought was a clever loophole, and then had the gall to complain about being brought to justice. Miners, it's simpler and more reliable to just buy the permit, no matter what activity you have planned. I agree the pilot need a mining license, no doubt. The article goes on to say she was using a noob ship because she felt safe, I simply disagree and feel like she did not feel safe. None of this debate matters, the code is by design one big loophole, It changes to fit the alleged crimes. Soon as everyone accepts it and deals with it the better. Anon 8:14's explanation could be valid.. but the reaction of the miner wasn't. If I'm using an expendable ship for I'm aware of the possibility that it may get ganked, I thank the agent who destroys it, possibly also offer to reimburse the equipment he used to pop my worthless noobship. This is the sort of practical interpretation that is so useful to Agents in the field. Praise James 315! I thought James put out guidance last year that stated ANY activities in highsec required a permit. This was when ganking freighters really started to catch on, and they were complaining that they weren't mining. Wow just wow. antigankers are still failing so incredibly hard. this must be embarassing for them. I think it's safe to say if you are in highsec you should be properly permitted. Ignorance of the law is no excuse for breaking the law. Every miner in the GHETTO knows the familiar sight of an exhumer wreck next to its pilots corpse was a warning from me. I liked to leave them in space like a farmer who pins the dingos corpse to the fence so that other dingos instinctively knew what would happen to them. Amarr regional James 315 space was more compliant back then. Dantan, i will be coming to check you soon. I am proud to say that the 520 corpses in my own private collection were all ethically slaughtered. IS it true minerbumping has been nerfed. Congrats everyone we have again nerfed the codebears. Dur another made up rule so we can pad our kill sheets. dur so elite dur. The Permit covers all Highsec activities. Only game design currently prevents us from entering your portion of any station to check your status. Otherwise, it's Pay and Display. You sound mad and ragey. Good job. And, all you have to do is check zkill to see gankers shooting ships that can, and do, shoot back. Your ignorance knows no bounds. Thanks for at least identifying yourself as a shitter so the rest of us can spot you easily. Not that it's hard to see that much retardation in someone's mental development. "Long story short, if you look like you're violating the Code, that's a violation of the Code in and of itself." Much like Jamey and this CHODE. slaves invite their victims to participate in RL Bonus Room shenanigans. A bunch of hypocrites. Are you all missing the point that a Code Ganker can't tell if a ship is flying towards a gate or if they are on a different path!